This story is about a miracle. If you don't know what a miracle is, you should by the end of this story. Just remember, only God can do miracles and He still does them today! Jesus had sent the twelve disciples out into the country and gave them the power to heal sick people and tell others about God's love. When the disciples returned, they met with Jesus to tell Him about all the people they talked with and had healed. They were all very excited to tell Jesus about their adventures. The problem was, people followed the disciples so they could find Jesus. They had seen the miracles He had done and wanted to see more. But Jesus knew the disciples wanted to talk to Him. They hadn't even had a chance to eat yet, so He said to them, "Come with me and we will find a quiet place to talk and get some rest." So they went away by themselves in a boat to a quiet place. But many people saw them leaving and recognized them and ran after them on land. The boat Jesus and the disciples were in was slowed down because of wind, so the people actually got to the other side of shore before them. When Jesus and the disciples arrived, they noticed the large crowd. Jesus felt love for these people because He knew they needed a teacher and someone to believe in. He knew that the disciples would understand, so He began teaching the large crowd many things. It was starting to get late in the day and none of the people had supper yet. The disciples came to Jesus and said, "There is no food around here and its already getting late. Maybe we should send the people away so they can go to the surrounding towns and get themselves something to eat." But Jesus replied, "You give them something to eat." The disciples didn't think that they understood Jesus right and said, "We can't feed all these people, we would have to work almost a year to pay for all the food!" While the disciples were talking to Jesus, one of the disciples named Andrew noticed a small boy walking by with a small lunch. He stopped the boy and asked him what he had. He quickly ran over to where the disciples were talking to Jesus and said, "Here is a boy with five small loaves of bread and two small fish, but how far will they go among so many people?" Jesus smiled and said, "Ask everyone to sit down." There was lots of grass to sit on so everyone was seated -- all five thousand of them. After everyone was seated, Jesus took the loaves of bread and thanked God for it. Then the disciples passed around the bread and everyone could take as much as they wanted. He did the same with the fish. 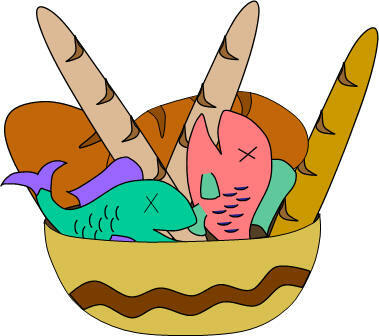 Remember, these were five small loaves of bread and two small fish, only enough for a boy to eat. There were five thousand people all eating from this boy's small lunch, and they could eat as much as they wanted. There are probably more than five thousand people at your church or school, it's a lot of people! After everyone was full, Jesus asked the disciples to gather all the food that was leftover so nothing would be wasted. After they gathered all the baskets of food, they counted them up. There were twelve baskets still full with some bread and fish from the little boy's small lunch. His small lunch probably barely filled one of the baskets before Jesus touched it, and that is a miracle! After the people realized what had happened, they said to each other, "This must be an important person sent from God." He was much more than that!